When multiple teeth are missing it becomes even more critical that a well thought out treatment plan is conceived. The factors involved can increase greatly from one in which there is just one missing tooth. These situations often involve compromised bone and remaining teeth that are not in proper position. A proper map is needed to get to the final destination and in these cases Dr. Byun makes sure that nothing is left to chance. 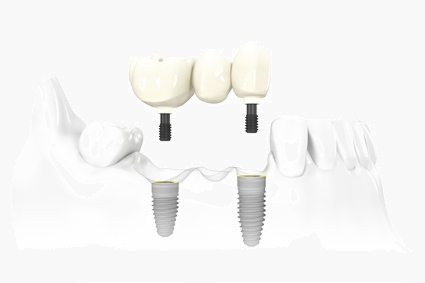 What is possible now with dental implants was unthinkable just a few short years ago but it takes skill, training and experience to bring it all together correctly. Because of this Dr. Byun works closely with his Oral Surgeon and dental laboratory to achieve excellent outcomes.